Beyond 535 members of Congress, the NMMA regularly deals with 13 federal agencies and dozens of states on a range of issues. At this year’s Miami International Boat Show, the keynote address by National Marine Manufacturers Association president Thom Dammrich centered on three initiatives that the trade group plans to devote additional resources to going forward. The first is retaining and recruiting boat owners. The second is addressing workforce issues. The industry has heard about those two initiatives for at least a year. Number three, while it has been in play for a while, was only recently announced: an advocacy offensive. That gathering happened after the Morris-Deal Commission, chaired by Bass Pro Shops founder Johnny Morris and Maverick Boats CEO Scott Deal, came out with its report on the future of saltwater fisheries management. From that 2014 report came an advocacy effort that, in fits and starts, resulted in the passage of the Modern Fish Act. The legislation passed unanimously in the U.S. Senate, and by a vote of 350-11 in the U.S. House of Representatives. President Trump signed it into law this past December. The law’s enactment followed a prolonged lobbying effort by the NMMA, American Sportfishing Association, Coastal Conservation Association and Congressional Sportsmen’s Foundation, among others. It was the industry’s signature advocacy success for 2018. “It showed what we could accomplish if we had a vision and worked together,” Vasilaros says. Dammrich says the NMMA has put additional resources into advocacy efforts during the past 18 months. The association expanded its communications team in Washington, D.C., and hired new staff to work on state issues. 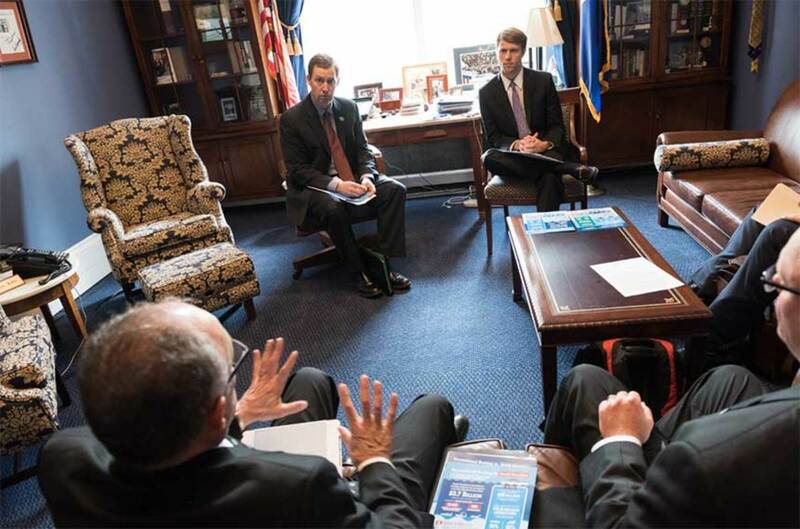 The association has been encouraging members to advocate for the industry with congressional visits and other outreach efforts. U.S. Sen. Cory Booker, D-New Jersey, and U.S. Sen. Gary Peters, D-Michigan, signed on as sponsors of The Modern Fish Act following visits to the Viking Yacht Co. facility in New Jersey and the Tiara Yachts headquarters in Michigan. Dammrich’s ability to build coalitions extends beyond the boating industry to groups such as the Outdoor Recreation Roundtable, which deals with federal agencies that affect boating. The majority of marine trade associations lets the NMMA do the industry’s heavy lifting on national issues. Peter Schrappen, vice president and director of government affairs for the Northwest Marine Trade Association, says about 90 percent of his group’s efforts go toward state and local issues. “They can be all-consuming,” he says. Vasilaros says the NMMA plans to form coalitions with other industries, and Dammrich hopes to see more NMMA members join the advocacy offensive.